Project DIY Condiments #1 is underway. I just whipped up a batch of Worcestershire sauce and my kitchen smells amazing! I don't think I can wait the three weeks until I can try it. I want steak and I want it now!!!!! I feel much better now. What's on the agenda for today? Oh yes, soup. I talk with my sister, who is in Austin, just about every week. Lately we have been reminiscing a bit about old times. Since we both worked at the library for a good amount of our adult lives in Austin, that comes up a bit. Usually around the context of - you guessed it - food. I don't remember what got us started, but we were talking about a cream of mushroom soup recipe that I think she discovered in The Settlement Cookbook, and then passed on to me. It's ironic, because when we were little kids and our Mom would plop down the tuna casserole made with cream of mushroom soup in front of us, I would happily slurp it down while both my older brother and sister would gag and moan because they couldn't stand the mushrooms. "They look like snails," my sister cried. "They're too slimy," protested my brother. I paused, fork halfway to my mouth, and really looked at the dish for the first time. Jeez - slimy little snails! I put the fork down and refused to even look at a mushroom for years. But years did pass, I'm happy to say, and at some point I did look at them again. And when they are beautiful white button mushrooms that you bring home fresh and slice into a salad, they are neither snail-like nor slimy. My sister discovered them a bit before I did; again, ironic to me, since I blamed her for my not liking them in the first place. So I'll just say we both came to an understanding about mushrooms not far apart from each other, and she found this wonderful recipe that was fast, easy, and delicious. My sister also remembered that every year some of our co-workers would travel around the hill country visiting all of the county libraries that were in our area of the state library system. Each of those little towns was known for something, and one of them (unfortunately, I don't remember which), grew mushrooms that could be bought for a very good price. They would take orders and bring them back. I found myself in possession of a good 5-pound bag of the beauties, but I didn't know a lot of ways to prepare them and I couldn't make enough salads before they would start to go bad. And I think that is when my sister found the cream of mushroom recipe. It calls for half a pound of mushrooms but was easily doubled. And it was good to double it because it was creamy and earthy and chock full of mushroom goodness. I have one other fond memory connected with that soup. The night that I made it as part of a dinner for friends was the first time that I timed all of my dishes so that they were all ready at the same time. I had been trying for a few years, and I still remember how good it felt not to have anything sitting out getting cold while waiting for that last dish to be done. Talking about it with my sister gave me the urge to make it again. I planned to make it the week before last but the mushrooms just didn't look that good to me, so I decided to wait. This week, I found the most beautiful crimini mushrooms that looked like they would do the trick. They are drier and more firm than the button mushrooms I used to use for this soup, and I thought they would be nice and meaty. I took home two half-pound containers, thinking I might make two batches of soup so I could play around with them a little. For the first batch, I sliced the mushrooms. I also used my trick of using part broth, part water for the liquid. In this case, it was a mistake. 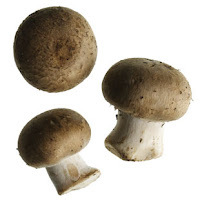 The mushrooms, while earthy and flavorful, could not add enough flavor to the watered-down broth. I kept adding salt to give it some flavor, and ended up with a soup that, while still edible, was too salty for my tastes. There also wasn't a good ratio of mushrooms to soup. I wasn't terribly pleased with this first effort, and even wondered what we had liked so much about it before. I'm sorry to say I took some for my friend Jessica to try before I had eaten any of it, outside of the tastings I took when I was making it. For the next batch, I decided that I would chop the mushrooms, as the recipe instructed. The only reason I didn't chop them for the first batch was that I didn't really read the recipe until after I had already started slicing them and I didn't think it would make that big a difference. (Wrong.) And then I started thinking about other ways to bolster the flavor and the texture of the soup. 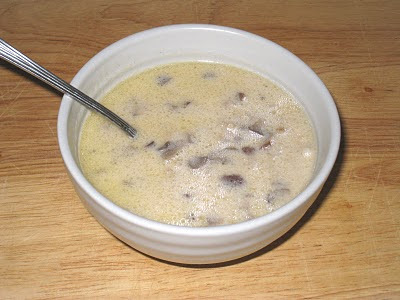 I thought of all the times I had seen mushroom barley soup at the soup and salad bar at the grocery store. I was sure barley would offer a nice contrast to the mushrooms. They have a mild, nutty flavor and a strong but not overpowering texture. Because the soup does not take long to make I cooked the barley up beforehand. I added half a cup to 2 cups of boiling water and let it cook for 20 minutes. I stopped when it was still a little more crunchy than I wanted it to be, figuring it would finish cooking up in the broth while I made the soup. I was right. It ended up with the perfect texture. For the first batch of the soup, I used the butter called for in the recipe. For the second batch, I used the ghee I just made. The ghee is a little more healthy than the butter, but gives the soup that same roasty richness. I think I will probably use the ghee from now on. Adding barley to this soup takes it from a rich, tasty, starter course to a more hearty, satisfying soup that can be an appetizer or a meal. It's very good with grilled cheese. And Jessica, I'm sorry you only got to try the first, not-so-good version. I'll make it up to you, I promise! Put the 4 cups of chicken broth into the saucepan and bring to a simmer. Melt 2 tablespoons of the ghee (or butter) over medium-low heat in another 3-quart saucepan and add the mushrooms. Cover and simmer for 5 minutes. Add the mushrooms and the barley to the chicken broth. In the same saucepan in which you cooked the mushrooms, melt the other 2 tablespoons of ghee (or butter). Add the flour and cook, stirring, until the flour is bubbling and just starts to emit a toasty aroma. Add the broth with the mushrooms and barley, then add the cream and the milk. Season to taste with the salt and pepper. Serve immediately.